Two years ago we published the review of Wi-Fi SDIO card by AmbiCom. The card added the support of Wi-Fi to the handhelds without it. 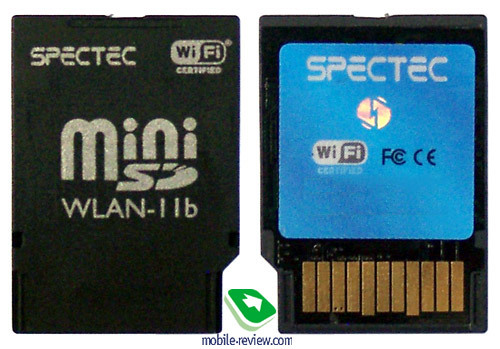 Today we’ll review a similar expansion card by the Taiwanese company Spectec. If the AmbiCom card has several rivals, the Spectec product is unique in its class. First of all we’ll explain to our readers what SDIO-peripherals are and how to use them. Advanced users can skip this chapter, as it’s an introduction. Compact Flash (CF) and Secure Digital (SD) expansion slots have become the standard for handheld PC (at less extent for smartphones). The only exclusion is Sony, which is promoting its own standard Memory Stick. 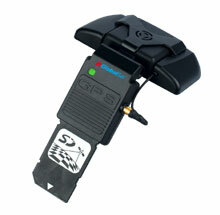 The SD slot usually comes in pair with the СF slot or separately (i.e. the single SD slot). 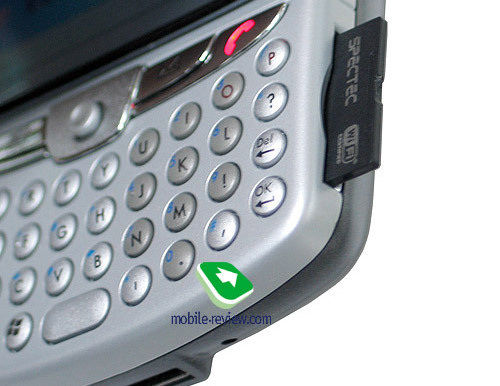 You won’t see the CF-slot alone, without the SD-slot (the exclusion – Sony PDA and Asus A620). Lately there has been a tendency of switching to the SD-slot for PDA and to the miniSD-slot in communicators and smartphones. You can use slots to expand the PDA memory. Without a storage card you’ll find it hard to listen to the music and watch movies, there isn’t enough RAM and internal memory to do it. Currently the maximum capacity of a SD-card makes up 4 GB and 2 GB for a miniSD-card. Almost always the SD-slot supports storage cards of MMC standard. At the same time the maximum capacity of CF-cards is 32 GB at the moment. In addition to storage cards the slots can be used to extend functionality of a communicator or PDA. Peripherals for the CF-slot have become most popular: cameras, Bluetooth and Wi-Fi adapters, GPS-receivers, GPRS-modems and so on. They are relatively cheap and can be easily found in shops in Russia. While the CF-slot is occupied with peripherals, the SD-slot is left to work with storage cards. If the SD-slot supports SDIO standard (Secure Digital Input/Output or SD I/O), it can also be used for peripheral devices, not only for storage cards. You can learn more details on SDIO specs in this document. Almost all peripheral cards in SDIO format (as in CF) do exist or are announced: Bluetooth, Wi-Fi, GPS, cameras, barcode scanners (except for GPRS-modems). TV-receivers and presentation sets (add projector out) are announced. There are the following problems in the development of SDIO-peripherals. These devices are still relatively expensive, if we compare with CF-format. For example, the price for a CF Wi-Fi module varies from $35 to $40, while the cheapest SDIO Wi-Fi costs twice as much. 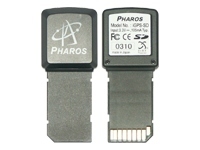 The same situation is with GPS-modules. SDIO-peripherals aren’t widespread, it’s hard to find the stuff in shops, and the choice is far from being wide. At last, if there is a single SD slot, you can plug either peripherals or a storage card, so you have to rely on the internal memory. All these problems are being solved step by step. The prices are falling, the choice is getting wider, there appear some peripherals involving flash-memory (for example, a Bluetooth-module + 256 MB). The miniSD standard is a reduced version of the SD, the same interface, but in a more compact shell. 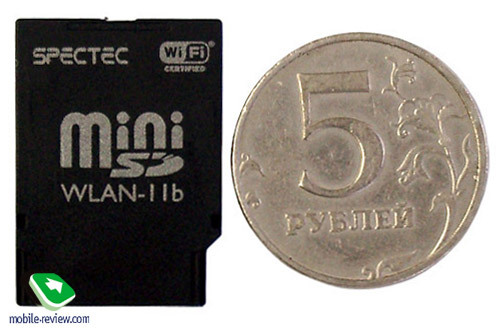 Like the “big” SD the miniSD format can support SDIO (depending on the manufacturer). However due to the tiny size, it’s almost impossible to place a peripheral device. The first and the only example of a miniSD peripheral is the SDW-822 card, which we review today. For which devices the SDW-822 card is meant, why there is need for it? 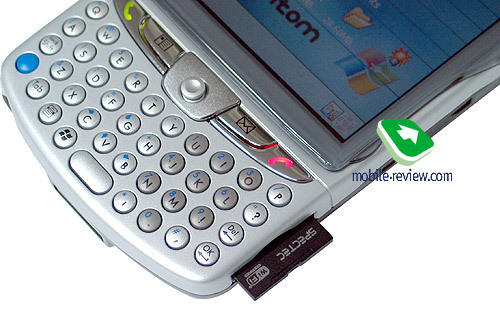 The makers of Windows Mobile communicators and smartphones ever more often apply the miniSD slot instead of the SD one, because there isn’t much room in a device, which in its turn is getting smaller. 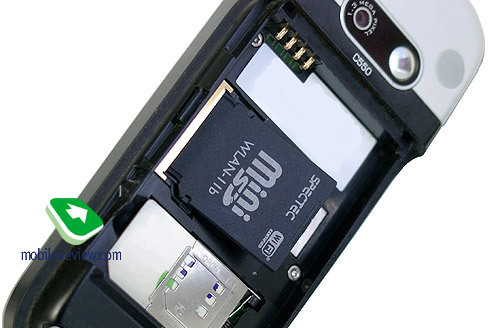 Many new models are already equipped with a Wi-Fi module, however not all of them (especially those supporting GPS), so the card might be very useful with the following models: HP iPaq hw6515. Qool Pocket PC, MiTAC Mio A700, E-Ten G500. We tested the card with HP iPaq hw6515 and MiTAC Mio A700. Despite of the fact that the box depicts Motorola MPx smartphone, the device isn’t compatible with the card, as well as HTC Hurricane. Firstly, there are no drivers compatible with their Windows Mobile 2003 for Smartphone, secondly, the models do not support the SDIO standard (according to the developers of cards). 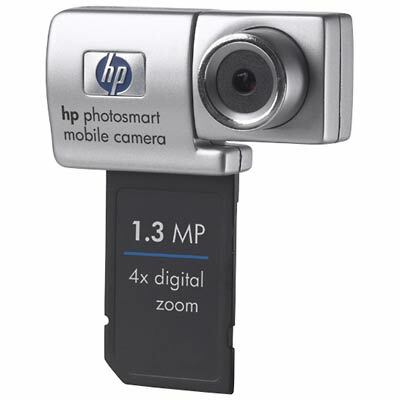 The plugged card sticks out by some 5-7 mm, have a look at it with HP iPaq hw6515 communicator. If the storage card isn’t removable, some modification of the shell is likely to be required (for example, you can plug the card to HTC Hurricane after you file the shell, however these are idle attempts, as the card won’t work any way in this model). It’s very easy to install the card – insert it and launch CAB-file with drivers. That’s all, then built-in software for Wi-Fi takes its turn (the support of Wi-Fi is integrated in Windows Mobile 2003 or higher). The device starts looking for available networks or other devices, the connection can be easily adjusted due to Zero Config utility. There are no special utilities to operate Wi-Fi, only built-in. The card is very easy in use, we haven’t faced any problems with it. Despite of the small antenna size, the signal reception sensitivity is good. In a 3-room flat working with the hot spot the device received the signal everywhere, the signal power wasn’t lower than 30% (that’s enough for Internet surfing and file downloading). The data transfer speed was limited by 1-megabit ADSL channel, which is even excessive for a communicator (though in the card specs we can read about up to 11 Mbps speed, the maximum for 802.11b standard). The connection was stable and got never broken. 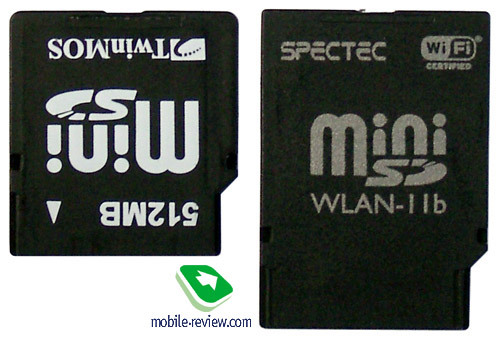 The Spectec SDW-822 card adds the support of Wi-Fi in WM-communicators with the miniSD slot. This is a unique peripheral (SDIO-device in miniSD format). 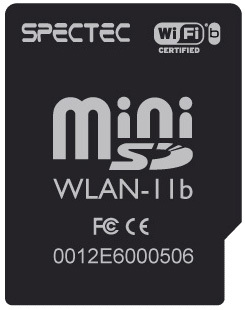 The engineers have done great deal of work placing all Wi-Fi components in a compact shell with size slightly bigger than that of a SIM-card. The price of the card varies from $110 to $130. This is an acceptable price, as the model just has no rivals. 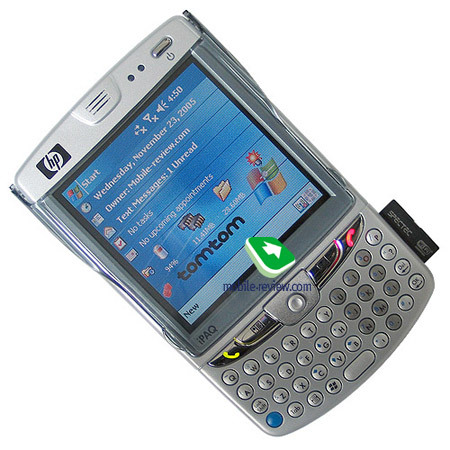 The handhelds compatible with the card are the following: HP iPaq hw6515, Qool Pocket PC, MiTAC Mio A700, E-Ten G500. Not that much, but the list of compatible devices will be wider with time.